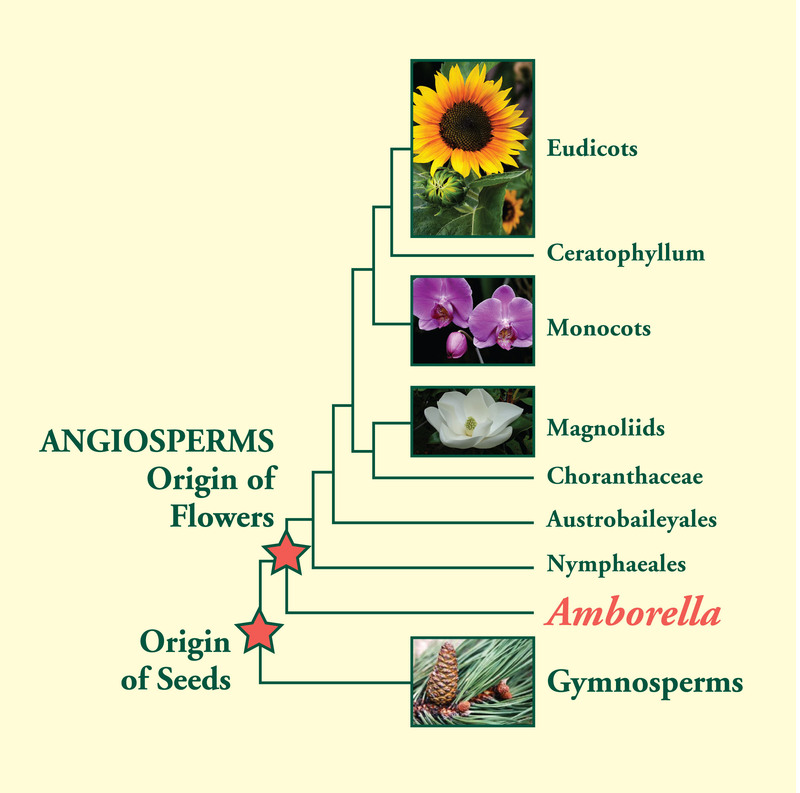 Being such an “early brancher” (or basal angiosperm) means that a map of Amborella’s genome could greatly advance our understanding of flowering plant evolution. In 2012 scientists with the Amborella Genome Project completed just such a map, which allows researchers to peer into the genetic toolbox of flowering plants at an early stage in their evolution. The Atlanta Botanical Garden provided Amborella Genome Project scientists with the live plant material needed for this important work. Why does this important plant live only on New Caledonia? This is tough to answer. Amborella trichopoda may once have had broader distribution — and more species in its family. Josh Der, a scientist with the Amborella Genome Project, characterized Amborella as being in a kind of “evolutionary dead end.” While it produces a small fruit, the seed coat is quite thin and without the starch or lipids that would make it attractive to animals that could disperse the seed farther afield. While it has flowers, they do not seem to attract specific pollinators. In fact, Amborella seems to depend on wind as much as it does other pollinators, so co-evolution with an animal species is not coaxing adaptation. On top of this, Amborella‘s seed has a poor germination rate and its wood is quite brittle. If you put it all together, Amborella trichopoda is not a prepossessing kind of plant. Nevertheless, it does well enough in the stable ecological niche in which it finds itself to survive to this day as a rather common plant in New Caledonia. How does Amborella trichopoda fit into flowering plant evolution? Answering that question is part of the work of the Amborella Genome Project. Amborella has a number of physical traits that are ancestral in nature (what once would have been called primitive). For instance, it is dioecious, meaning the male and female reproductive organs are in separate flowers on separate plants. This was common among gymnosperms, the dominate form of seed plants that came before flowering plants, but uncommon among angiosperms. The thing of it is, evolution is not linear, so Amborella likely evolved to be monoecious, like other angiosperms, and then lost the trait. Only looking at the genome will tell. Electron micrographs of female and male flowers of Amborella trichopoda. Photos: P.Rudall and M.Box. Actually, Amborella has another interesting quality when it comes to gender determination: It’s a gender-switcher. This is something Ron Determann, Conservatory Director and an expert in cultivating Amborella, has noticed in the plants he grows at the Atlanta Botanical Garden. Plants that start with male flowers can become female. This trait is not unique to Amborella, but it does make studying the plant’s genome interesting. Jim Leebens-Mack, of the University of Georgia and Co-Principle Investigator on the Amborella Genome Project, is especially interested in studying the genes that determine gender. Given its early position in the evolution of flowering plants, Amborella trichopoda‘s genome will help scientists — and the rest of us — understand how genes determine the kinds of distinctive traits that we notice in plant species all the time: Why the flower of a grass is so different from a rose, why one plant is woody and another is fleshy, why one plant grows to tree sized while another hugs the ground.